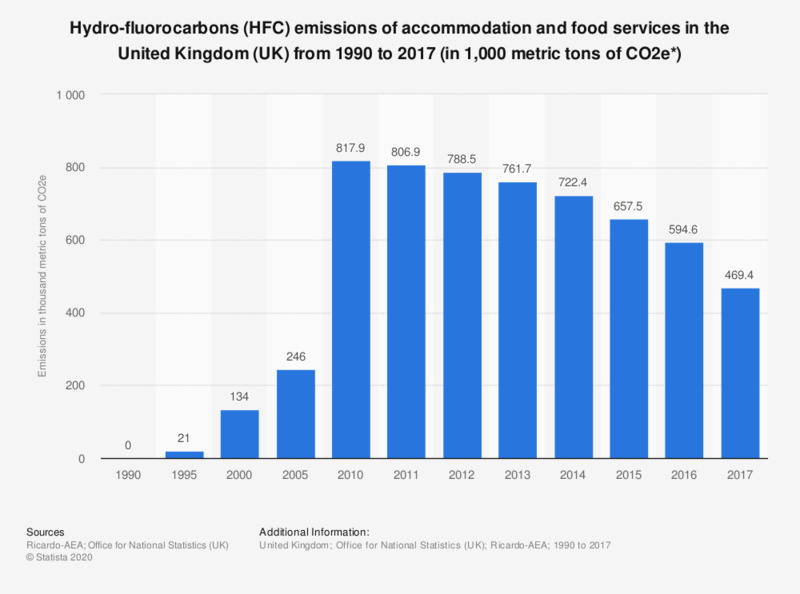 This statistic shows the amount of hydro-fluorocarbons (HFC) emissions attributable to accommodation and food services in the United Kingdom (UK) from 1990 to 2016, in thousand metric tons of carbon dioxide equivalent (CO2e). It shows that HFC emissions increased, rising from 21,000 metric tons of CO2e in 1995 to 595,300 metric tons of CO2e in 2016. Emissions peaked in 2010 at 817,900 metric tons of CO2e. Hydro-fluorocarbons (HFC) are used in refrigeration systems and are powerful greenhouse gases. Sector and industry classification is based on the NACE code, which is the industry standard classification system for economic activities in the European Community.